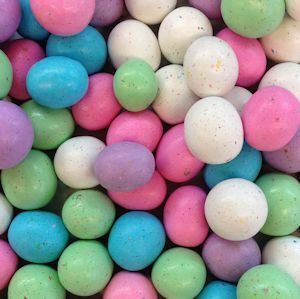 Home / Products / Seasonal / Easter Candies & Pops / Pastel Malted Milk Eggs, 1 lb. Pastel Malted Milk Eggs, 1 lb. Pastel malted milk eggs are a beautiful variation on the classic version that are beloved by so many, for so long. In soft, lovely pastel colors to accompany the season, these are a must for any well-appointed Easter basket. Milk Chocolate [Sugar, Cocoa Butter, Whole Milk Powder, Unsweetened Chocolate, Soy Lecithin (an emulsifier), Salt, Vanilla Extract, Lactose (milk)], Dextrose, Corn Syrup, Malted Milk Powder (Malted Barley, Wheat, Milk, Hydrolyzed Wheat Gluten, Sodium Bicarbonate, Salt), Sugar, Malt Powder Malt, Corn), Acacia (Gum Arabic), Artificial Coloring (Includes Titanium Dioxide, Blue 1 Lake, Yellow 5 Lake, Blue 2 Lake, Red 40 Lake, Red 3), Palm Kernel Oil, Confectioner's Glaze (Shellac), Rainbow Glitter [Acacia (Gum Arabic), Yellow 5, Blue 1, Red 40, Yellow 6, Red 3], Natural Flavor, Carnauba Wax.